Public speaking engagements are excellent opportunities for your company to share its unique message and gain industry credibility. Speaking engagements provide a chance to interact with prospective clients and reconnect with existing ones, and they also give your organization a chance to market company ideas and increase awareness. Speaking at any engagement is an efficient approach to increasing visibility within your market while sharing knowledge and enhancing your organization’s reputation. However, identifying public speaking opportunities can be difficult. Axia Public Relations will get the job done for you. 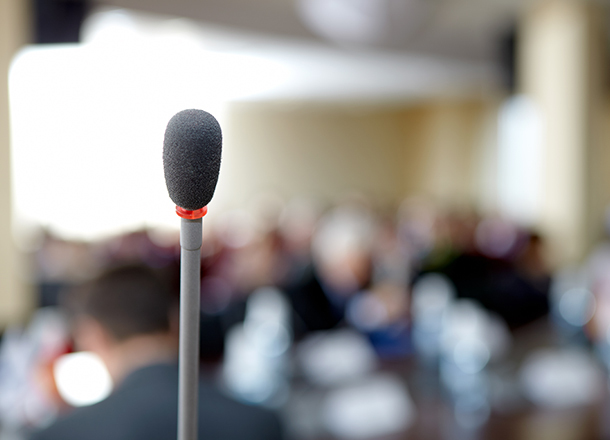 Our trained team of professionals recognizes the importance of boosting company visibility through public speaking. Whether you're looking for large or small audiences, we designed our exceptional KeyNoteSM program to identify these special speaking opportunities. We'll secure and book your engagement, then promote your event. I'm only interested in paid speaking engagements. Can you help me with that? Sure. Typically, paid speakers already have a proven track record of successful speaking engagements. The speaker's resume, references and highlight reel are what demonstrate this to venues. If you don't have these yet, we can help you get them! If you haven't already done so, you'll likely need to complete a series of unpaid speaking engagements first. Yes, reasonable travel expenses are negoitatable, assuming the organization that you're speaking to has some budget for travel reimbursement.